Please choose the type of waste. Need help? See waste types or contact us for more information. General household waste – Boxes, timber, furniture, white goods, electrical appliances, clothes, toys, carpet, green waste (additional costs apply to remove mattress, televisions, monitors, tyres and gas bottles). Bricks, pavers, tiles, concrete, stones, rocks, soils, food (putrid) waste, asbestos, liquid waste (paints, oils, thinners, chemicals) are not accepted as general waste. Bricks, pavers, tiles, concrete, stones, rocks and clean fill soils are accepted by the dump. Please note – No other materials can be included, not even the smallest amount as the dumps and disposal facilities enforce very strict rules for contaminated waste. Additional costs will apply. Grass, lawn, asbestos, timbers, organic waste, plaster boards, household waste, electrical waste are not accepted as quarry waste. A combination of general and quarry waste are accepted. Please note, due to the nature of mixed waste, it can only be disposed of at particular dumps. Liquid waste, asbestos and dangerous goods and substances are not accepted. Deliveries and pickups are completed throughout the day. 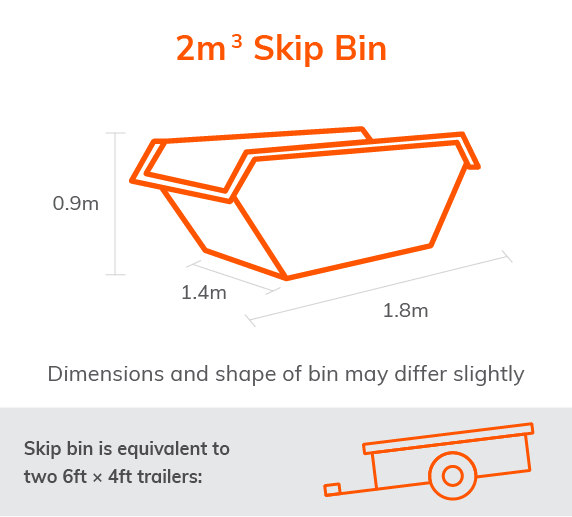 We recommend having your skip delivered one day prior to your intended start of loading. Selections more than 7 nights will incur additional daily fees.